Most of my trips are longer than one or two days. But in the next couple of weeks I have two overnight trips coming up and carrying a small overnight bag is essential for convenience and efficiency. That means limiting liquids to the infamous 1-quart Ziploc bag and making sure they are under 3-ounces. Something I have been experimenting with for months. I have tried numerous types of plastic containers trying to find the right balance between quantity and sturdiness. I need the right amount that will fit in one of those damn bags without them spilling all over. A lot of those flip tops open up, no matter how carefully you pack them, and I usually end up having to bring tape to make sure they stay closed. But on a recent trip I forgot to bring extra tape so I ended up having to throw away some lotion because I knew it was going to open up in transit and get all over everything. I hate it when that happens. I have finally found something that works for me. 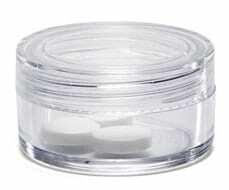 I can bring multiple containers, it fits the perfect quantity for 1-2 days, it is a screw top that does not come open, and they are inexpensive. Pill boxes. Not just for grandpa’s cholesterol pill! I get mine from The Container Store and rarely have to replace them. They clean out/wash-up well and can be re-used over and over again. In fact, even on long haul trips there are some products I use in such small doses that a pill box will last 2-3 weeks. What about you? Is there a liquid container you can’t travel without? Thx, i can’t agree more!